Excerpting from Danielle’s entry (on her blog), her project is a 3/4 length fully lined, tailored men’s wool coat. Her sketch appears below. It’s an outerwear wool coat with a dual closure (buttons and zipper). It has a convertible collar, meaning that it depends on how far up you close it as to whether the collar lays like a notched collar or with stand. The back of it has an inverted, topstitched pleat at the center back, as well as two vents. Vents are no fun, two vents are even less so. 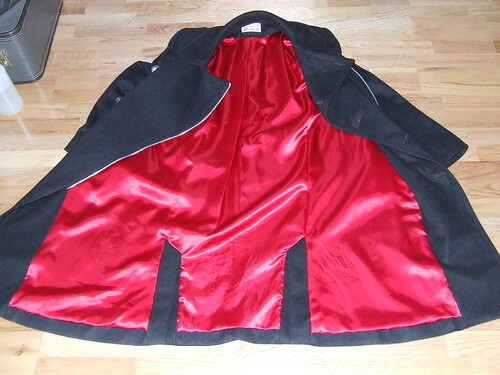 The only thing more complicated than a double back vent (in a sportcoat, this coat’s configuration is similar) is a double-breasted, double-vented coat….Oh wait. Danielle’s coat is double-breasted! The coat also has pocket flaps (set like welt pockets) and -get this- functional plackets on the sleeves and cuffs. She says she has no idea why she went to that much work but that “the idea of a decorative closure that is non-functional gets to me”. Better quality coats and sportcoats have functional sleeve vents even though they’re never used. I describe such things as a construction vanity -in other words, you know and can make them. In my opinion, there’s worse ways to prove yourself or show off. Involving Ray in the process changed things. He wanted a longer jacket, and back vents. There was extensive discussion of pocket placement. There were massively dramatic changes in every redraft. I squealed with delight when I saw the photo of the inside of the jacket -the lining was bagged entirely by machine. Danielle says it didn’t come out as perfect as she would have liked as she was still learning the “jump-pleat myth” thing which was a tutorial series I’d been doing here on F-I at the time (see the Nameless Tutorial Series). Here’s a photo of that corner; you be the judge. I think she did a great job (full size photo of the inside lining is here). Anyway, visit Danielle’s full length entry on her site for more details. And get your carnival of couture submissions in soon! Speaking of, where are those Sewing Divas? I figured they’d have oodles to submit. I really like the functioning sleeve vents! And, this is a very nice overall design, too. Good job, Danielle! I agree w/ the comment that functioning vents are technical vanity (I still love them on my suits, tho). They’re difficult to execute when your client is interjecting style changes along the way, which inevitably delays the delivery of the final product. My recommendation is to work fast and carefully select the stages of development when meeting with the client. Style changes are less likely to happen when you’ve closed up the seams. Collaboration can be a lot of fun; but, there are draw backs you need to manage. Establish firm business rules and definitions as soon as you possibly can (e.g. modifying the style after you’ve cut will increase the labor and materials (i.e. re-cut)). Incidentally, some Europeans will leave the first button undone on one of the sleeves to show off that their suit is bespoke. Thanks Kathleen and J C Sprowls! I’m honoured that you both got a kick out of my tailoring project. I’m amazed and relieved that you think I did a good job! That’s an amazing jacket! The work that looks like went into that coat is tiring to think about, hee. Did your boyfriend not like the idea of the shoulder thingies? Is there a technical term for those things? I really like your initial sketch and agreed with you that it should of been kept shorter.